Bangkok (Thailand) – March 12, 2018 (travelindex.com) – Rolls-Royce Motor Cars, the pinnacle purveyors of super luxury, will debut the all-new Phantom Extended Wheelbase to regional audiences at the 39th Bangkok International Motor Show 2018. At the same time, Rolls-Royce Motor Cars will also reveal a one-off Bespoke piece of art inspired by Thailand, made by porcelain craftsmen Porzellan Manufaktur Nymphenburg. The grand debut of this top-of-the-range model reaffirms the brand’s commitment to Thailand, the only South East Asian country with three Rolls-Royce showrooms, as an important market in the Asia-Pacific region with truly discerning patrons of luxury. For 93 years, only one car has continuously earned the title of being ‘The Best Car in the World’, and had the privilege of conveying some of the world’s most influential and powerful men and women to the most defining moments in history. With an all-new design language that embodies power and presence, New Phantom promises to be a rare and magnificent sight around downtown Bangkok. Rolls-Royce’s famed Magic Carpet Ride is enhanced thanks to a new four-corner air suspension system, an intelligent stereo camera system that reads the road ahead, and more than 130kg of soundproofing material padded into the car. The result is an overall driver and occupant experience 10% quieter than the previous generation Phantom – a car already critically-acclaimed for its near-silent ride quality. The beating heart of New Phantom is an all-new twin-turbocharged V12 that produces 563bhp and 900Nm, with maximum torque generated from just 1,700rpm. Power is delivered silently and effortlessly, further enhancing the Magic Carpet Ride. The all-new Rolls-Royce Phantom brings with it a host of new technological innovations and effortless power, whilst taking Rolls-Royce’s signature hallmark of Bespoke handmade luxury and automotive art to levels never before seen. Inside the new Rolls-Royce Phantom, an uninterrupted application of glass across the front fascia provides an unprecedented opportunity to present artwork, within your motor car. An understanding that the super-luxury marque’s patrons are increasingly collectors of fine and contemporary art led the Rolls-Royce Design Team, fronted by Design Director, Giles Taylor, to create a space behind this glass in which patrons can commission and curate art, a space aptly named ‘The Gallery’. “As patrons increasingly commission a Rolls-Royce for its aesthetic power, they trust in the knowledge that only the finest materials fashioned at the hands of a collective of skilled artisans will produce a motor car that transcends its primary role as a means of conveyance, to become a meaningful and substantive expression of art, design and engineering excellence. ‘The Gallery’ is an innovation that furthers Rolls- Royce’s unparalleled Bespoke capabilities. Patrons are now invited to commission artworks for their own personal Gallery within Phantom, in essence, bringing art, within art.” Torsten Müller Ötvös, Chief Executive, Rolls-Royce Motor Cars, said. Rolls-Royce’s standing as creator of the most celebrated objects in the world is informed by an intimate understanding that true luxury is personal. This philosophy has driven the marque’s collective of designers, artisans and engineers to constantly evolve the canvas from which patrons of luxury can express their tastes and lifestyle requirements. An intrinsic part of the Rolls-Royce Design team’s responsibility is to understand and immerse themselves in a world of luxury far beyond automotive horizons. Drawing inspiration from the worlds of fashion, art and design, the collective continually examines the work of experts in their fields, furthering skills and knowledge in order to push the boundaries beyond the limitations car designers are usually confined to. From a simple application of wood or metal, to a more complex use of materials not normally viable in an automotive context and enhanced by incorporating relief, ‘The Gallery’ extends the patron’s experience of curation with the marque to a new realm. In this spirit, Alex Innes, Rolls-Royce Bespoke Designer and Creative Lead Designer of ‘The Gallery’ Artist. Commissions, has invited artists and master artisans from around the world to interpret ‘The Gallery’. The result? A collection of unique and artistic creations, free from the constraints of automotive design, to inspire the marque’s patrons, in a way that only Rolls-Royce can. disposed expectations of additive manufacturing and computer generated design by creating an alluring and visually complex fascia for New Phantom, adapting the use of technology to render an artwork as unique as a fingerprint. Franck begins by capturing the patron’s character in a unique algorithm. This data is then transcribed using the art of 3D printing, forming the largest piece of 3D printed stainless steel featured in a production car, made possible only by this use of additive manufacturing. Here, traditional artisanal craft blends exquisitely with tomorrow’s production methods. More than one day of polishing produced a work worthy of being plated in 24 carat gold. The work interacts with the changing light of the day, reflecting brilliance whilst casting shadows. The visual characteristics of gold ensure each observer’s experience will be a personal one dictated by their physical position in Phantom and the strength of the sun’s rays or soft glow of the up-lit stage lights on the gold, set within ‘The Gallery’. A truly individual rose, conceived and bred exclusively for Rolls-Royce in the English countryside by award-winning Harkness Roses, was flown to the Nymphenburg Palace in Bavaria, Southern Germany, to awaiting master artisans from world-renowned porcelain manufacturer Nymphenburg. Here, the rose was examined in its varying stages, from bud to lush flower in full bloom, and crafted freely by hand in the finest of porcelain for the elegant sanctuary of ‘The Gallery’. For this collaboration, a new porcelain formula was developed in the manufacturer in Munich, Germany. The development process alone lasted three months in order to create porcelain as fine as the petal of the rose itself. The range of roses depicted shows the varying stages of the life of this rose, with some of the most elaborate blossoms consisting of up to 80 individual elements freely shaped by hand. The delicate aesthetic is accented in a contemporary way by the marriage of black and white, a pairing uniquely perfected for this artwork. Until now, the processing of white and black porcelain paste has been strictly separated in the manufactory’s production process, as even the smallest residue of black paste on a craftsperson’s tools, invisible to the naked eye, leads to impurities that only become visible after firing. Black porcelain had previously been held for the preserve of casting, meaning the black paste had to be developed to ensure it was as malleable as its white counterpart. For this unique design, white and black paste has been created in parallel, in the same soft state, at the workstation of Anton Hörl, a master craftsman for Nymphenburg for over 40 years. But each individual blossom only acquires its final appearance when it is fired. Since the porcelain changes during the firing process, and also shrinks by 17 per cent, individual firing supports have had to be made. Also made from porcelain, these supported the blossoms and leaves, preventing the draw of gravity. The white and black bisque porcelain has been fired in a single process for the first time, requiring the expert knowledge of the Nyphenburg kiln foremen, who have developed a process with different firing curves, which achieve an optimal result in just one firing process. The rose, bred for Rolls-Royce by Philip Harkness of Harkness Roses, was developed for its strength, resilience and intricate bloom. The flower is large, opening from a plump rounded bud into a large cupped bloom. The rose is strong with an admirable resistance to disease. ‘The Whisper’, has graced the prow of every Rolls-Royce motor car since 1911 and in doing so, has become a muse to artists around the world for over 100 years. Helen is an artist with a natural affinity with fabric. Her work masterfully sculpts textiles, most frequently leather, suede and their faux counterparts, into unique three-dimensional decorative surfaces and compelling works of art. With a wide portfolio ranging from large-scale wall hangings to unique pieces of furniture, Helen’s work captivates in its sculpted textural form. With a Masters Degree in Textile Design from London’s Central St Martins, Rolls-Royce Bespoke Colour and Trim Designer, Cherica Haye, was perfectly placed to collaborate with Helen. Together, they experimented, developed and refined various iterations of this Gallery’s design. By creating different planes to the design through directional sculpting, Helen has created individual contours, beautiful in their own right, that fuse together to form a larger cohesive figural form. “The sweet spot of luxury is a beautiful crafted object, but somehow at the core of the object, is something that is personal to the client.” Ian Abel, Co-founder, Based Upon. It is a resonant understanding of this belief that led Rolls-Royce to Based Upon, a collective of artists located in the heart of London’s East End. A desire to commission an item so personal it becomes a treasured legacy, surpassing superficial material acquisition to become true luxury, is epitomised in A Moment in Time. The work beguiles, speaking of the perceived control on time that Phantom commands. Time stands still as you encounter the presence of the motor car. Considered storytelling is at the heart of Based Upon’s ethos. The collective journeys the world uncovering rich narratives to inform works ranging from public sculpture to finely crafted surface applications for private residences, which have aesthetics at the fore, blurring the lines of function and meaning. Personal significance lies at the core of both Based Upon and Rolls-Royce’s endeavour. The former, with tales of the patron interwoven to the heart of its being, the latter, an item which transcends its original role, to become an aesthetic representation of personal endeavour. “The spirit of Rolls-Royce, namely, speed with silence, absence of vibration, the mysterious harnessing of great energy, and a beautiful living organism of superb grace…”, the prose of Claude Johnson, Managing Director of Rolls-Royce at the time of the Hon. Charles Rolls and Sir Henry Royce. Based Upon sought to encapsulate this spirit which is still found at the heart of the marque today, alive in the Spirit of Ecstasy as she graces the prow of each motor car made at the Home of Rolls-Royce. The creation of A Moment in Time is as remarkable as its muse. A swath of silk was pulled through a tank of water, weighted and suspended, controlling this moment. Captured on camera, the resulting fluid form was then analysed by the Rolls-Royce Design team and the artists of Based Upon, before being remastered in clay. A malleable wax sculpture was then reworked to optimise the impact of ‘The Gallery’s’ space. This final interpretation was machined from a solid billet of aluminium, polished to accentuate the curvature of the alluded fabric. 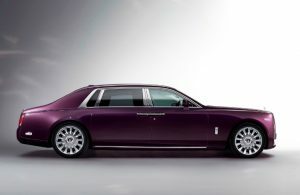 Phantom has been the canvas for some of the most opulent expressions of true luxury in recent years. From handwoven, hand-embroidered and hand-painted silk, to elaborate depictions of cityscapes made from thousands of individually set pieces of marquetry, Phantom embodies the Bespoke wishes of patrons like no other. British Designer and Goldsmith, Richard Fox, has himself been part of Phantom’s rich history. The allure of gemstones and the desire of Phantom’s patrons to furnish their interior cabin with precious metals and captivating stones has led Richard Fox to embellish many personal Rolls-Royce commissions with precious and semi-precious jewels including diamonds, emeralds, sapphires, rubies and Tanzanite. Astrum, meaning star, constellation, glory, immortality and Heaven, was a concept produced by Alex Innes of Rolls-Royce Bespoke Design and Richard Fox of Fox Silver for New Phantom’s Gallery. Inspiration was sought from artists who had explored the starburst formation in both the natural and man-made world. Sea urchins and plants, explosions and skyscapes, all had influence on Astrum’s final design. A star burst emanates from a centrally placed single brilliant cut diamond, encased in platinum. Each solid silver spear, filed, soldered, shaped and hand-polished, has been created to carry pear-cut amethysts, evoking a precious jewel-like quality to the artwork. The backing has been engraved with a guilloche effect, a technique found in the finest of jewellery, formed to incorporate the curvature of the dashboard and to provide visual depth to ‘The Gallery’. A rich amethyst lacquer, named Violet de Nuit, is used to reflect and intensify the colour of the stones carried at the ends of the spears. The clock, viewed by many patrons as the jewel of the interior, carries an additional guilloche design in sterling silver with the same amethyst tint complementing that of the main body of work. Fine wires have been laser-welded to the spears, positioned so the stones stand proudly against the resplendent backdrop. Wings of flight transcend the worldly stage to cosset Phantom’s occupants in rich, iridescent, sumptuous luxury. Swiss-based Nature Squared creates beautiful things for beautiful spaces. Applying heritage artistic crafts to ethically sourced and sustainable natural materials, Nature Squared embrace technical innovation to transform nature’s beauty. In a move that echo’s the views of Rolls-Royce, Nature Squared embraces artisanal skills which are the antithesis of mass production. Their work can be found in the upper echelons of many industries where a desire to be surrounded by objects of outstanding natural beauty prevails. individually shaped to accentuate the sheen and rich hue of the natural feathers and hand-sewn onto an open pore fabric in a design that originates from the heart of ‘The Gallery’, the clock. Additive manufacturing was used to emulate the musculature of a natural wing to bring life to the creation, creating an atmospheric artwork that brings both movement and fragility to this Gallery. The clock alone is a work to be revered. Continuing their exploration of organic materials, the centrepiece is inlaid with ethically and sustainably sourced Jade green abalone, which emphasises the lustrous texture of the feathers. Liang Yuanwei is a widely acclaimed and internationally exhibited Chinese artist. In her commission for the New Phantom, she ponders the Autumnal tones of the English countryside that surround the Home of Rolls-Royce in West Sussex, which she encountered during her time with the marque. The atmospheric countryside of England, with fertile soil and abundant vegetation and differing layers of colours from green to yellow, even red, are redolent in her artwork for ‘The Gallery’. Liang Yuanwei applies paint so thickly that it appears almost sculpted, carving floral and geometric patterns whose fissures are filled with additional layers of paint to create a finish resembling silk or satin. Her work masterfully captures the impression and texture of fabric through her application of paint. Here, from seemingly random strokes applied from left to right, come exquisite forms. In a serene and meditative scene, the closer you observe, the more you find. “I saw that it was possible to combine my artistic vision with the vision of Rolls-Royce. I have found a common ground between my own creative system and what I feel is the culture of Rolls-Royce. My work references this. commented Liang Yuanwei. She continued, “Like painting, the many aesthetic details of a car represent the brand’s values and heritage.